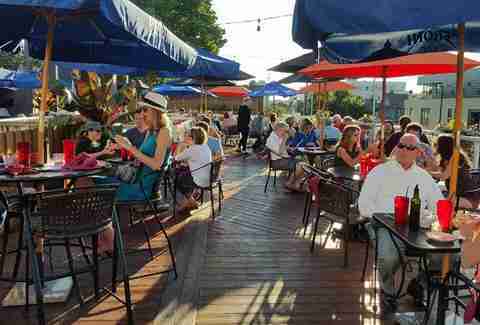 This is a great neighborhood spot and you can feel it the second your feet first hit the patio. It not only makes a lot of great beers, but it also has a good rotation of local guest taps and pretty good food, a lot of which is smoked on-site. This simple and mostly unassuming patio may not be at the top of a lot of people’s lists, but there’s just something about it that screams out for a glass of wine and a plate of frites. It’s the perfect late-night spot, nestled just off the beaten path and featuring a pretty great late-night happy hour menu. 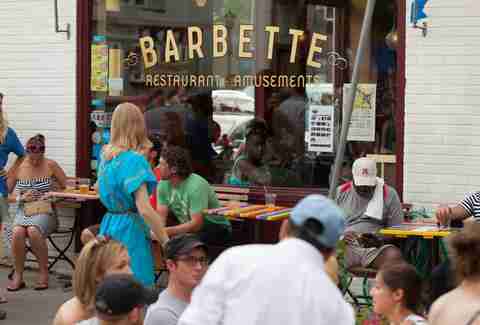 It’s a slice of the good French life right in Uptown. 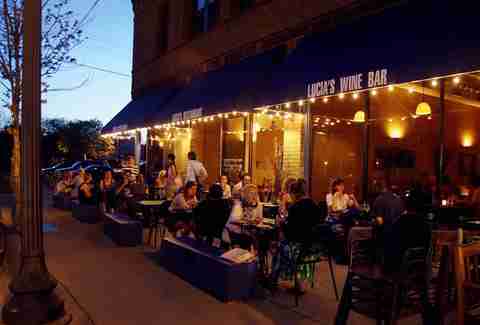 This is another perfect spot for a late-night bottle of vino and some classic bistro food. This place also sits a bit out of the way from the hustle and bustle of a fairly busy cross-section of the city, but it provides the perfect ambiance for a little nighttime relaxation and conversation. 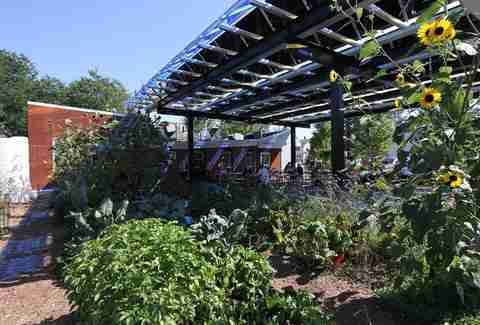 The Twin Cities' greenest restaurant also happens to have one of the best patios. With a lush garden running all the way around and good selection of craft beer, wine, and wine-based cocktails, it’s a great atmosphere for letting the world’s weight off of your shoulders. 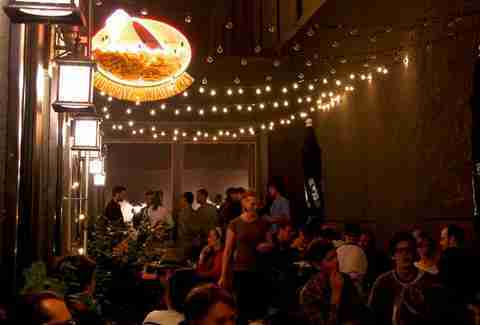 The food is good too, and during happy hour, it offers a rotating variety of delicious munchies. 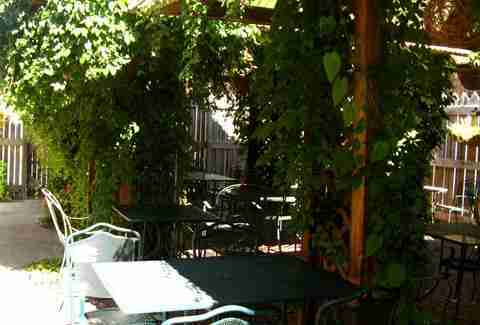 This intimate little patio setting is as gorgeous as it feels secluded, although, sitting just off the busy intersection of Lake & Lyndale, it’s really anything but. There’s also an excellent selection of craft beers, a fanciful variety of whiskey, great food, and a sweet punk rock vibe. Nab yourself a tall boy of PBR, a shot of whiskey, and an order of the fish tacos. Perfection. 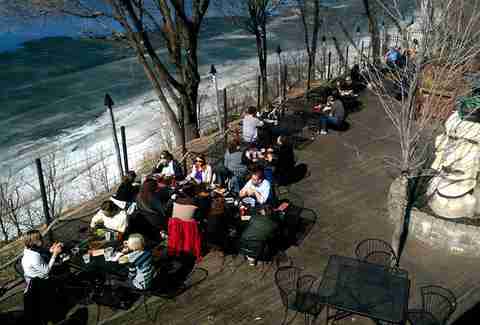 Who doesn’t want to sit and look out at the river and the scenic Stone Arch Bridge while drinking a tasty beverage and noshing on top-shelf seafood? Hanging out in one of the oldest/newest parts of the city couldn’t get any more enjoyable. It also offers late-night happy hour specials all week long featuring several of its craft cocktails and good deals on delicious snacks. Patios are good and all, but when you go and put one on your roof, you’re really upping the ante. Seriously, somehow pizza and beer seem to taste better when you’re that far above the street. 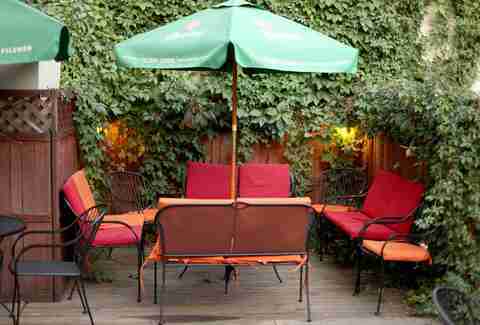 This patio might be small, but what it’s lacking in size, it more than makes up for in charm. 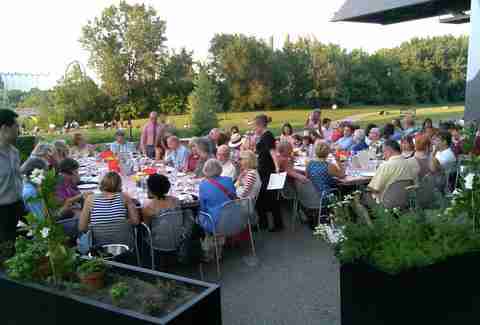 Even though the restaurant is located right smack dab on Washington Ave, you almost feel as though you’ve been swept into some intimate French courtyard. The cocktails are delicious and if you’re feeling adventurous, you can jump down the rabbit hole and try out some of Chef Patrick Atanalian’s crazy creations. 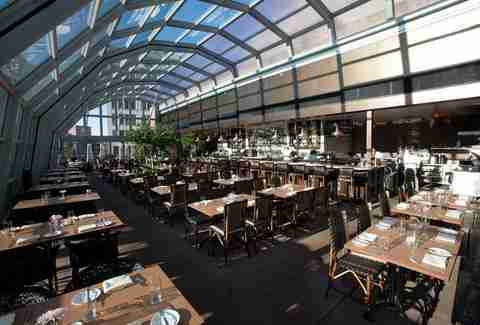 Another rooftop patio worth checking out... even on rainy nights since it comes complete with a retractable top. You can grab a cocktail, order a ceviche, and just take in the night sky, or if that's a little sedate, head down on one of the nights it has a DJ and dance under the stars. This patio’s got views for days! Head on over to this Lyn-Lake party bar and take in the night air while you sip on house-brewed sake and go to town on some fairly decent ramen. It's also got a pretty good late-night happy hour offering a variety of specials and small-sized snackables including pork belly steamed buns, plum wings, or Thai-style fried rice. If you can nab a spot on this rooftop monolith, congratulations, because you just found yourself some prime real estate. The views are incredible and the vibe is incredibly laid back. The cocktail menu is laced with a variety of boozy, fruity drinks which, when paired with a platter of delicious oysters, are perfect for some of those hot summer nights. 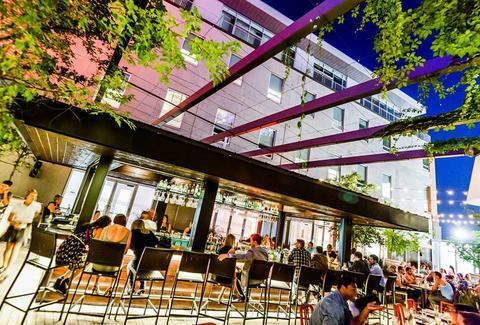 This patio is nestled right in the heart of Downtown, which is actually pretty sweet. 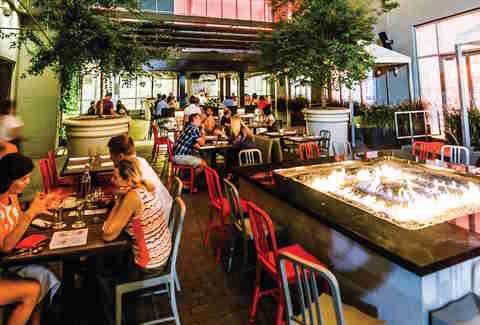 There’s a lot of seating and it has great late-night happy hours that extend to both Friday and Saturday nights, so you can hangout Downtown, outside, and not have to break the bank. Nab a martini and an order of duck confit steamed buns and you’re set! 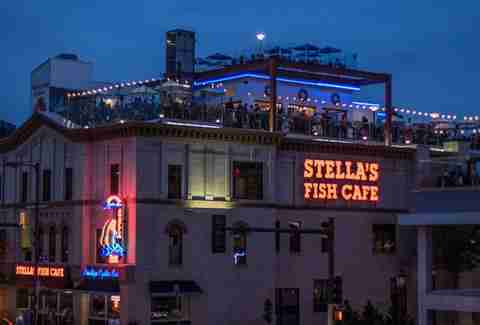 If you’re looking to drink giant flaming Tiki drinks on the banks of the Mississippi, then this place is 100% for you. The patio is large, but it fills up quickly so head on over early to secure your spot in Tiki heaven before it’s too late. If you’re feeling a bit peckish, it's also got a pretty decent selection of bar snacks to choose from. Might we recommend the Potluck Pickle Roll-ups? 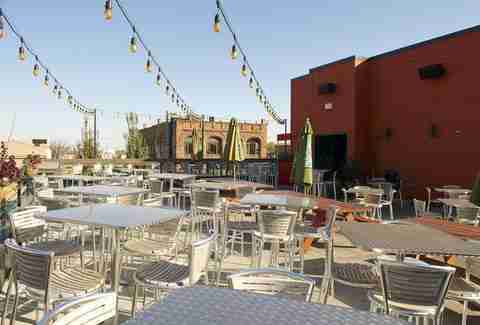 While we can’t exactly speak from first-hand experience, we’re assuming that the patio at this St. Paul location is better than anything you’d actually find in Russia! Of course we kid, but seriously, this patio is gorgeous and perfect for sipping on a variety of vodka-based cocktails and Russian-inspired snacks like the blini with caviar or an order of its beef and cabbage piroshkis. 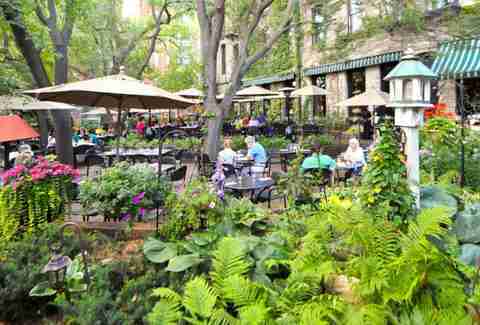 The patio at one of the Twin Cities' most underrated restaurants is definitely a sight to behold. 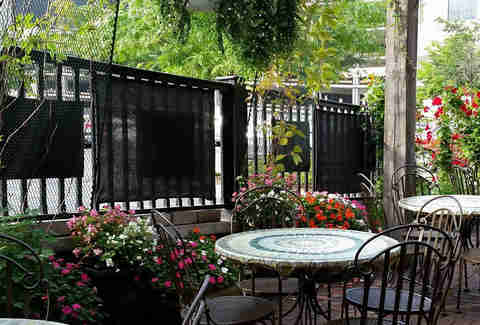 Fenced in and completely removed from the hustle and bustle of surrounding Lake St, this vine-entrenched patio is the perfect spot to sip on any one of its delicious cocktails, its legendary charcuterie plate, or one of its expertly crafted farm-to-table-inspired dishes. 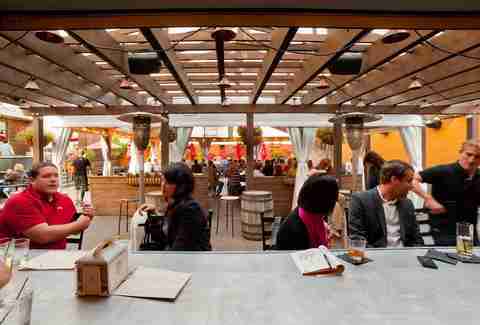 When it comes to beer gardens, this one definitely takes the cake. Featuring an elegant design and a spectacular variety of craft beers and delicious bourbons, it’s the perfect spot to just sit and hang out with some friends. It also doesn’t hurt that it serves a slew of sweet sausages. Oh, and if you forget to try its take on the foot-long hot dog, you’ve done messed up. 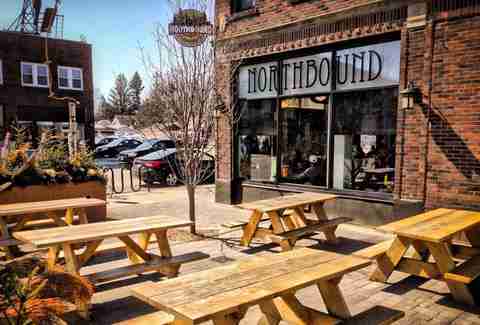 The patio at this St. Paul institution is the gold standard for patios in the Twin Cities. Not only is it scenic beyond belief, but it’s also huge. With that being said, nabbing a seat can still be a little difficult, because as one might imagine, it fills up fast. It’s all good though; its cocktails and small plates, ideal for snacking, will more than make up for any wait that you might endure.